This one is huge for INFJs. If you’re not a safe person for us to be around then we either 1) won’t enter a relationship with you or 2) will be trying to get out of the relationship. We desperately need to know you won’t dismiss us. We don’t actually expect you to fully understand all our quirks, nuances, and oddities but we need to know you will accept and even love them. We need to know you’re interested in getting to know the “real” version of us and that you won’t run away when we start opening up. Similarly, we typically have strong values and we’re looking for someone who lines up with them. INFJs can be very accepting of other people’s differences, but the closer you get to us the more closely we want you to line-up with our core beliefs. It’s hard for INFJs to open up to people. Most of us have met too many people we don’t feel safe opening up with in the first place. Or we’ve been dismissed too many times by people we thought were safe. So if we start talking with you you need to listen. Don’t minimize our fears, worries, and concerns or make a habit of interrupting us. If we don’t feel heard then we’ll stop trying to let you in and that’s the beginning of the end for this relationship. Also, we will be saying things non-verbally as well. Just because we’re not talking doesn’t mean we’re not telling you something. Feel free to ask questions if you don’t understand something (or to check that you do understand), but don’t just assume that because we aren’t talking nothing’s going on in our heads. We INFJs live in our heads. That’s where we process all the incoming information and observations we’re making. We may forget to include you in our inner world until you ask us what’s going on. Also, because we hate confrontation, there’s a good chance we won’t tell you something we think you might not want to hear. 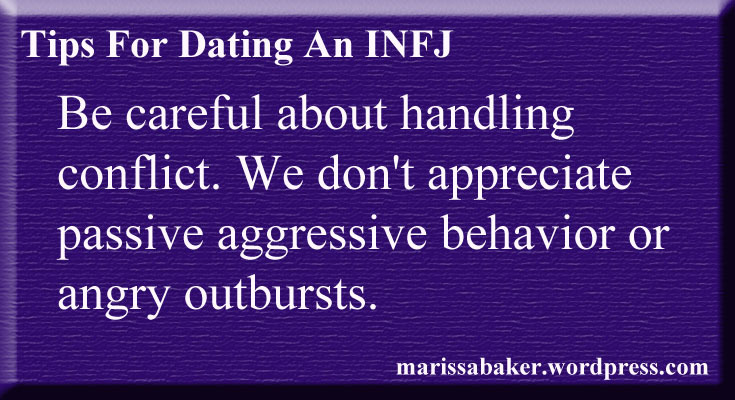 In fact, many INFJs will let you walk all over us and break our “soft” boundaries (the things we’d rather not have people do but don’t see as worth the emotional tole of an argument) until you hit a “hard” boundary (the things we won’t compromise on for anything). When you hit one of those boundaries, we’ll “snap” and not only tell you about that boundary but also the others you crossed before hand. We know that’s not healthy. But unless we feel safe with you we will hesitate to share earlier. You can help with that by asking us directly whether or not we’re okay with something or what we want in this situation. That signals us that it’s safe to tell you. We want to listen to you as much as we want you to listen to us. And while we’ll listen to you talk about everyday things because we’re interested in what interests you, what really captures our attention is deep discussions. Tell us about your hopes, dreams and plans. Share your fears, worries, and doubts. Tell us about the things in your past that made you who you are now. The more open you are with us, the more connected we’ll feel to you and the safer we’ll feel about being open with you. Deep, meaningful discussions are a huge part of how we bond with other people. If you won’t do that with us then we won’t feel like we can have a real relationship. We’ll want to talk about everything. That includes our relationship, but it’s so much more than that. For INFJs, the inner world is more “real” than the outer world and there are lots of thoughts going on inside our heads. Also, the safer we feel with you, the more we’ll share. Don’t assume that if we’ve had once conversation on a topic that you’ve heard all our thoughts on the matter. 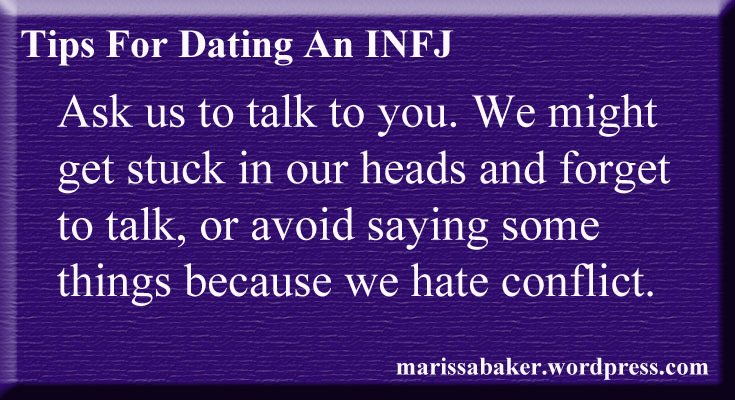 This is one of the most important things you need to realize about communicating with an INFJ. If we talk about something we might only share about 10% of our thoughts on the topic. It’s not because we’re trying to hide things from you. It’s because that’s all we had access to in that moment. INFJs think in long-term, constantly developing patterns. We’ll be pondering and sifting through ideas for weeks or months. So don’t be surprised if we keep going back to important discussions over and over again and want to keep exploring and refining ideas as well as our own emotions. If you really want a complete, well-thought out answer all at one time your best bet is to give us time to write it down. 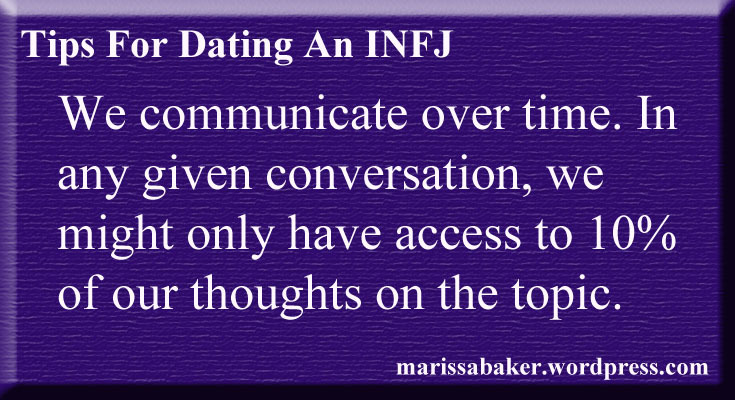 Many INFJs communicate best in writing, even with the people they’re closest to. 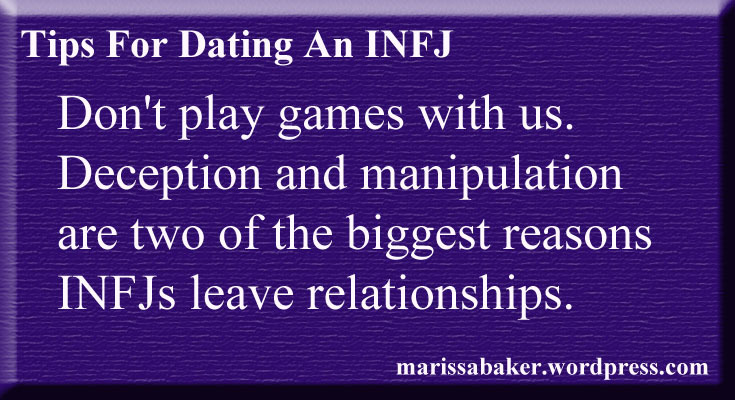 Deception and manipulation are two of the biggest reasons INFJs leave relationships. If we feel like you’re not being sincere, we’re out of here. If we find out you’re purposefully deceiving us, it’ll be well-nigh impossible to win our trust back. If we find out you weren’t really serious about the relationship, we’ll feel betrayed. If you try to control us, we’ll walk. As a general rule, just be honest and straight-forward with us even if it’s about something that you’re pretty sure would annoy us. We would far rather hear a truth that hurts us now than learn you were snaring us in a beautiful lie. We’re very much in-tune with how you make other people feel. We can’t feel comfortable around someone who is constantly putting the people around them on edge. It will affect how we feel about you because we see it as part of a pattern for predicting your future behavior. We’re watching you to decide whether or not you’re safe and we assume that if you’d hurt, bully, or dismiss someone else you’ll eventually do that with us. We do not appreciate rudeness, pushing past someone’s “no,” gossiping about other people, or purposefully embarrassing someone in public. We like to know you’re happy to be with us. Feel free to brag about us to your friends and act like you’re proud to be seen with us. 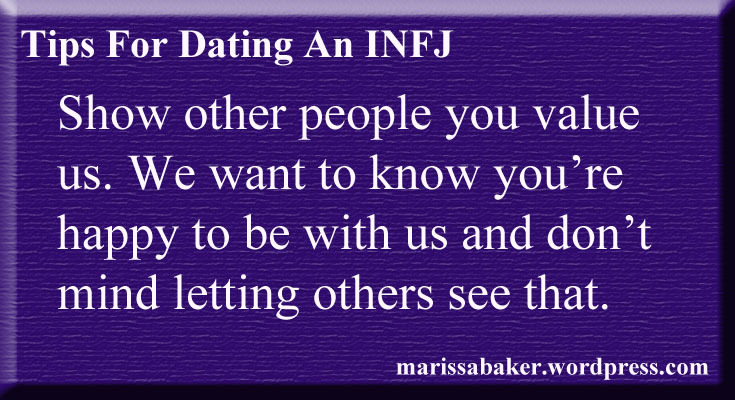 Many INFJs are insecure about their worth and little gestures in this area go a long way toward reassuring us that yes, you really do want to be in a relationship with us. 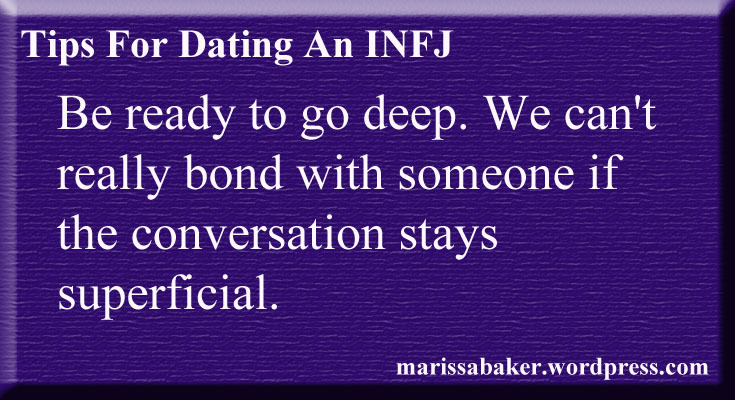 You’ll have to check with the INFJ you’re dating about how much and what type of PDA they’re comfortable with, but in general we like holding hands with you, or having your arm around us, or kisses on the cheek, or when you touch us lightly to let us know you’re there. We love being around you. We wouldn’t even consider being in a relationship with you if we didn’t want to spend time with you. But we’re still introverts and we need our alone time. 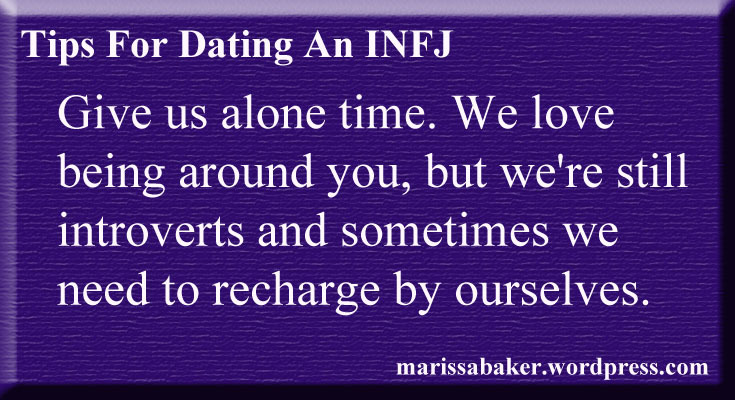 Sometimes, we can get that alone time feel with you if there are no other people around and we’re relaxing together (we can actually “map” you into our inner world so you don’t drain us like most people do). But there will still be times when we just need to get away and recharge. If we shut down and withdrawal for a little while don’t take it personally. Better yet, hold space for us to spend time alone without making us feel guilty about it. 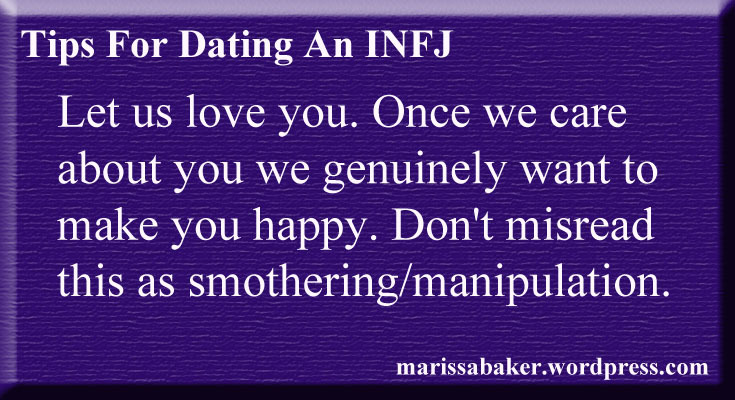 INFJs are sometimes accused of being smothering, intrusive, and manipulative in how they show affection. That is not our intention. Once we’ve decided we care about you then we genuinely want to make you happy and help you in any way we can. So let us shower you with love without worrying if we have some ulterior motive. And if we do seem a little obsessive over you, assume it will pass as we start to feel more secure in the relationship and learn how you prefer for us to to show our love for you. We know learning how to handle conflicts in a healthy way is key to a good relationship, but that doesn’t make confrontation any easier for us. There are two big mistakes people make in handling conflict with INFJs: 1) being passive aggressive or giving us the silent treatment, and 2) angry emotional outbursts. The first makes us feel like you don’t care or you’re trying to manipulate us and the second one makes us feel unsafe. We can forgive hurt caused in arguments (we’ll probably hurt you and need forgiveness, too), but we need to trust you didn’t mean to hurt us. We want someone who’s willing to work through conflicts in a non-threatening way. Never ask an INFJ “what’s the worst that could happen?” We have active imaginations and we’re constantly projecting future possibilities. No matter how good our relationship is going we’ll probably question it. We don’t do that because we don’t trust you or want to leave you, but because we want to be prepared for how things might change. We probably have at least one plan for how we might react if you cheat on us, die in a horrible accident, get cancer, or run off with a rodeo. It’s nothing personal; it’s just how our brains work. We might worry that this question makes us seem insecure and needy, but we’ll either ask other questions we hope will answer it or we’ll come right out and ask why you like us. There are several reasons for this. We might worry that you like us for the wrong reasons — that you’ve misinterpreted us in some way and fell for an idea of us rather than who we really are. We might have so much rejection in our pasts that we don’t understand why you want us when other people didn’t. Whatever the reason we’re asking, we’re looking for an answer that shows you’ve thought about this, that you’re serious about our relationship, and that you understand us. And there you have it. 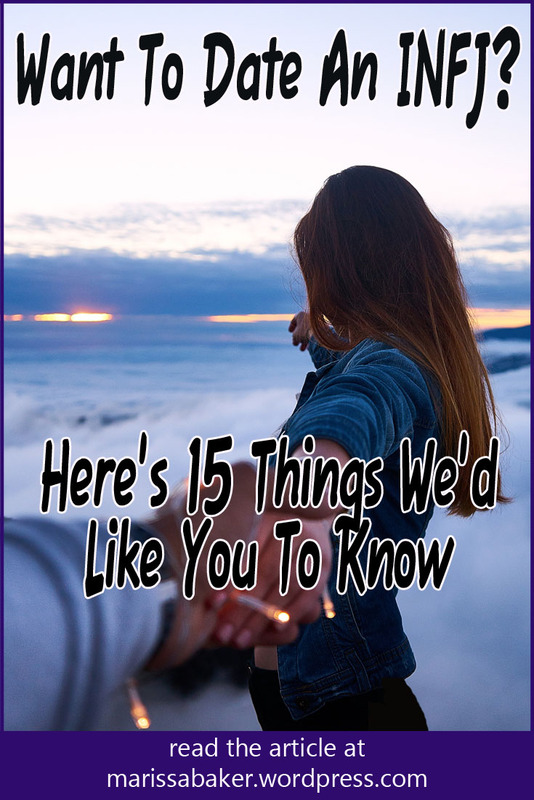 Fifteen things INFJs want you to know if you’re going to date one of us. This could easily have been a much longer list, but I think we hit most of the important points. 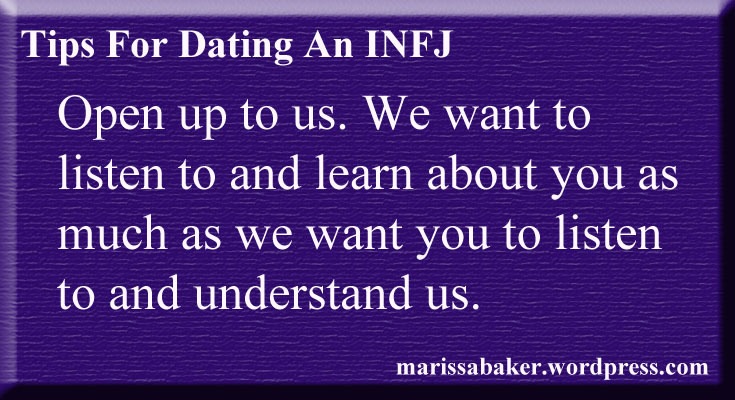 If you’re an INFJ or have been in a relationship with one we’d love to hear your thoughts, comments, and other INFJ dating tips below! Marissa! I love this! 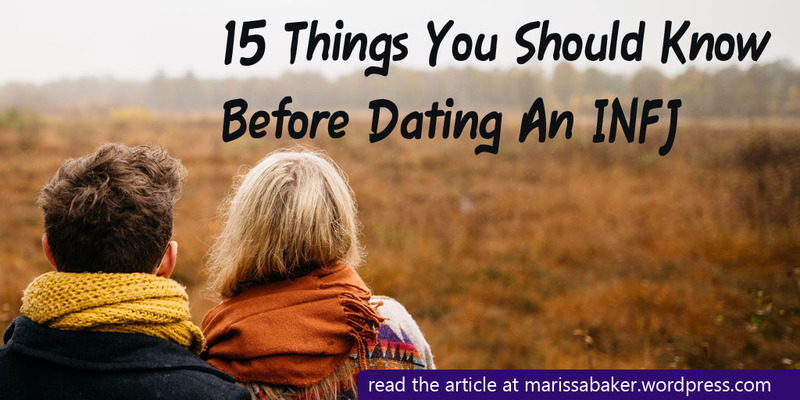 especially #14 … I worry my hubby is going to run off with the rodeo just about every week! How did you know?? Sometimes I question if I’ve been mis-typed and I’m actually an intj and other times I question if I’m actually an infp. Then I toss aside the ‘test results’ and start to question if I’ve mis-typed myself. You know, maybe I’ve missed something in my studies on the topic… But once in a while I find an article about infj’s that when I read it I think, “Aha! 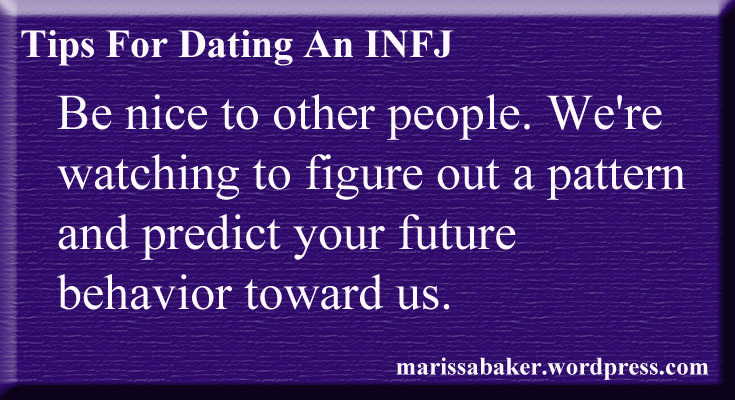 See, i was right all along: in every way; I am an infj!” The rationale you give for each point, I have actually stated either aloud or in silence. Great article! Thank you. You’re welcome 🙂 I loving finding articles that seem exactly like me, too, and I’m glad mine was like that for you. Hi Marissa! Thank you for your blog! I too and an INFJ to the fullest and I am also a devout Christian. I love the Lord with all my heart, mind and soul. 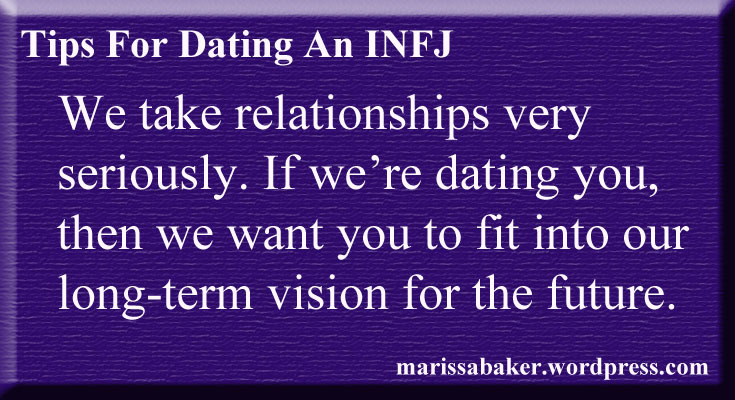 Your blog on dating an INFJ is truth and I love the fact that you’ve done your research! The facts are truly accurate and I’m very pleased to meet another INFJ personality! May God continue to use you in your endeavors and thank you for reaching out to others to understand us! We are rare! Very accurate representation of what is going on in our minds…all the time! For better or worse, this is how it is and it’s not only an affirmation for us, but a way for anyone interested to take a peek at how we operate and our values. It’s like you’re living in my head. What a wonderful, thoughtful, precise article. You’ve nailed so much of what its like to date one of us. Would you mind if I shared this with a closed INFJ Facebook group that I am a member of? Thanks, Derek 🙂 And please do share it! I’m happy to have people share my articles, or even re-post sections as long as they give me credit and link to my original post. Hi Marissa, thank you for the great insight into the personality. I’ve fell in love with a INFJ man (he doesn’t know it yet) and I am doing my homework to understand him and hoping my knowledge about his personality will have a positive impact on our relationship. I am trying to understand what he meant when he said I am going too fast for him and he needs to get his head around it. We haven’t spoken for a month now as I thought I would give him space. I’ve decided to send him a text saying Hello and asked how he was doing. So far no answer yet…Would you be able to help me to understand it please? If you still want a relationship with him, I’d suggest contacting him again and just try to keep things casual and friendly for now. Hopefully he’ll get back in touch with you and then you’ll have a chance to talk with him about what you both want the relationship to look like going forward. Thank you so much for your insight. I am an ENFP female that has started seeing an INFJ male. He’s a good person, but quite inexperienced and insecure. I feel we’ve established a deep connection with each other, but unfortunately we are geographically challenged. 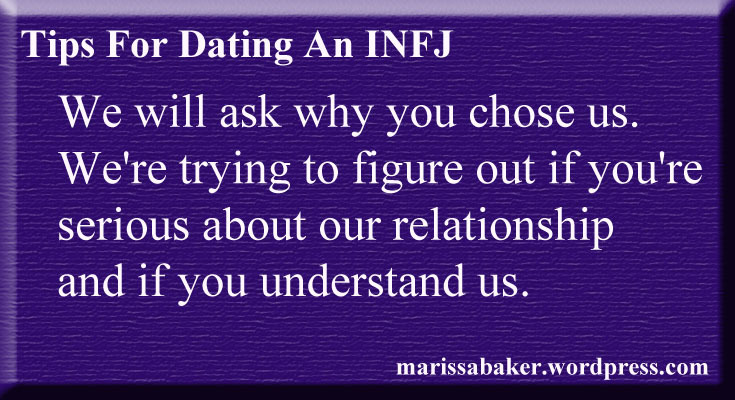 I guess my question is: In a relationship it goes both ways, so if we do take into consideration the list that you provided, at what point do INFJs consider the other person? Like you mentioned communication, opening up and feeling insecure are things that trouble INFJs, but then how do you know what the relationship will be like unless you ‘dive’ into it? It seems like INFJs might put up a lot of their own obstacles? You’re right about INFJs putting up a lot of their own obstacles. Even when we know that, though, just “diving into” a relationship is very scary for us. 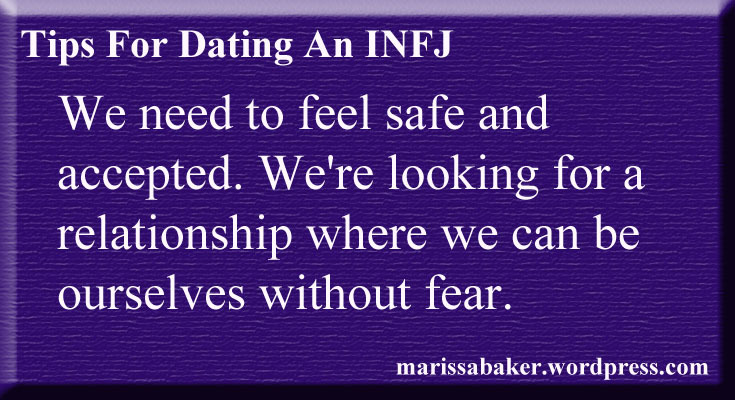 Healthy INFJs will recognize that the risk can be worth it and give relationship a chance. But it’ll still take time to work-though our insecurities and there’s a good chance that communication will always be something that requires quite a bit of work on both your parts. 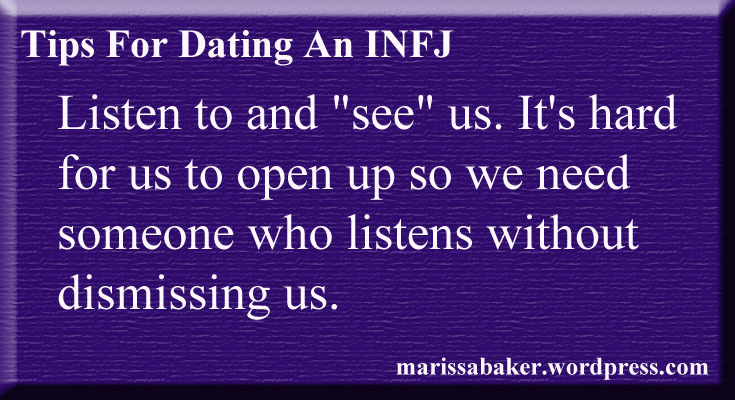 Most INFJs will take the other person’s feelings and needs into consideration, though we might need you to tell us exactly how you want us to do that. FJ types tend to say “I love you” by meeting the other person’s needs first, checking into make sure they’re okay, and showing appreciation in ways that make us feel appreciated (Personality Hacker has a great article on this: https://personalityhacker.com/personality-type-ask-love/) If you’re speaking a different love language, it’s important to talk about that and make sure both of you are saying “I love you” in a way that lets the other person feel loved. I hope this helps, and I hope things work out well for you! That’s me! In every way! How’s that even possible for someone to describe me so precisely when I haven’t been able to figure myself out until recently? Thank you thank you thank you! Now I know how to explain myself to people. I have an infj friend who’s been badly hurt and before I decided to be a friend for him and told him this, that whilst he sorts through things in his inner world and figure where he stands with things and everyone in life(he’s just recently broken up with someone he got with out of sympathy and feels awful that he doesn’t find him attractive, it was only a short term relationship). But then I pop up and well, I’m quite a persistent guy if I REALLY REALLY like someone, which is very rare for me. We hung out, chatted deeply for hours and it ALL felt electric, exciting and even though we didn’t laugh that much it was great fun. We eventually kissed and you tell that we were VERY much equally sexually attracted, as well as emotionaly and mentally. He even said when I asked if there was feelings for me and he said yes. He’d said a couple of times that he needed to take time for himself to focus on him. Physical attraction usually isn’t enough on its own for an INFJ to pursue a relationship (I just broke up with a guy I was very attracted to because we clashed in areas that were more important to me). So there’s a good chance you were reading his interest correctly, but that what he said about needing to focus on himself is more important for him at this time. 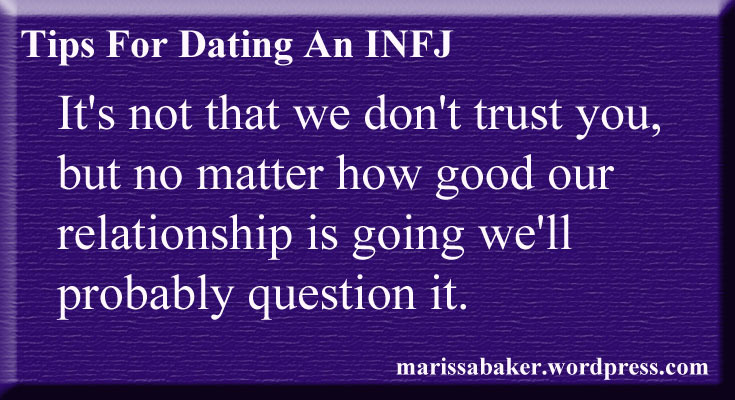 INFJs like to really commit in relationships and it’s hard for us to move forward with another person if we don’t feel like we have ourselves sorted out well enough (whatever that means to the individual INFJ). I’d say for now it’s probably a good idea to just focus on the friendship. The physical attraction wasn’t the only area that we are attracted to each other. World views, similar interests and tastes etc… Emotional mutuality and other things too. But yeah, I respect his need to focus on himself for a bit and will focus on friendship without it needing to be more.